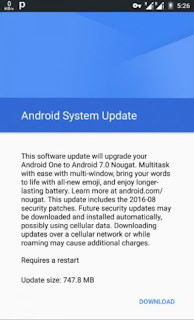 The much-anticipated http://specifications-price123.blogspot.com /2016/07/google-announced-that-android-70-will.html">Android 7.0 (Nougat) has been rolled out (Over-The-Air update) and the Nexus 6P finally received the Android 7.0 update a few days back, after it's been on hold since the release of the new OS due to some issues with battery and performance. We heard that the Cherry Mobile G1 which is already run on Android one, is one of the first device to receive the Nougat update, but other Android One phones are likely to get the update in the next couple of weeks, if not sooner. 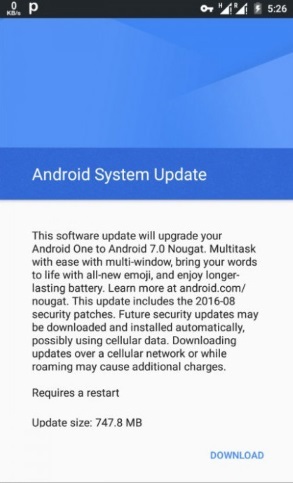 Henceforth, Android one OS smartphone users should be expecting the update on their device. You can even check your phone right now to see if the update is already available for you to upgrade your device. If it's not yet, it's just a matter of time as the software update will hit your phone soon. Note that this is a fairly large download (about 750MB). Some of the highlights of the upgrade include easier multitask with multi-windows, new emoji, as well as longer-lasting battery. If you are using Infinix Hot 2 or any other Android One smartphone, we would like to hear from you if your device has received the software update notification.